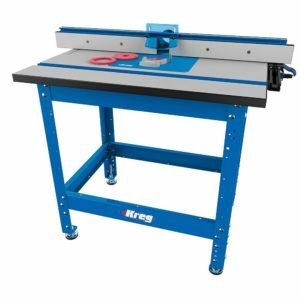 If you are looking for a router table that will give you value for money, Kreg PRS1045 Precision is the one you should consider purchasing. The first good thing about this table is it provides a large space for the users. Besides, the package includes additional tools that will be useful in your work. It is a product that has all you require for excellent routing experience. It is strongly designed to suit for DIY as well as professional woodworkers to accomplish any task quickly, easily and with amazing precision. Whether you are a beginner in woodwork or a professional, you will be able to achieve your goal with it. Consumers who have used this Kreg router table before have also confirmed that it has all they need to obtain an excellent output. T-square fence is very useful feature as it allows to square the fence automatically making it possible to make some adjustments. Beginners or first time users who are not used to fence adjustment will find this product useful. It is consistently parallel to the T-slot and the miter. The fence locks strongly in place and it constructed with high grade aluminum so that it will be able to provide support to large stock pieces. The face of the two sliding faces is meant to be used as a vertical jointer. This product comes with a specious tabletop which provides large workspace for users. It has a dimension of 24 inches x 32 inches. The tabletop is made from a durable fully enclosed aluminum extrusion material and thus with its durability, you will be able to use any wood on it for many years and nothing will happen to it. The table top does not sag because the edge is banded and reinforced with steel struts. Featherboards are important features in router table given that they offer security to the user. It prevents your fingers from getting into the router tool so that it will not be wounded. Besides this, they also provide support to the workpiece and make it to remain consistently straight. This product comes with two featherboards meaning that it gives enhanced security. PRS1045 comes with an insert plate that is constructed with reliable and strong phenolic and it can be mounted on any router to give an excellent fit. When the router is mounted, you don’t get additional holes that will be of no use to you. Such rings matches the insert plate of the table easily and quickly. It gets fitted into it without requiring you to tighten any screw before it will become flat. The rings perfectly fit into the plate. Insert rings are available in several sizes which include 2.5/8″ hole (large bits), 1-3/8″ hole (that will match the porter-cable-style or universal template guide bushing). The router table top is supported and suspended on strongly made stand made from steel. The stand can be adjusted from 31 to 36 inches in height. Your work environment will not be littered with dust if you are working with this product thanks to the dust collector where the dust generated during the work will be trapped. This feature of Kreg router tables helps to reduce friction during routing. Owning and working with this product will give you a number of benefits. Below are some of the pros of PRS1045. This unit is highly durable because of its essential units that provide supports to other components are made from high-grade mental materials which can be either aluminum or steel. Given its mental construction, it can withstand a little abuse to which it is exposed to in the workspace. Shocks from falls or woods have little or no effect on it. The fence is quite easy to adjust. With one hand, you will be able to adjust the fence. Removing the fence and locking it securely in place when you are not using it are easy task to accomplish and does not require expert handling. Working with this router table does not result in dirty work environment as the dust generated is trapped into the dust port that comes with it. After routing and doing all the wood, you won’t have to spend time again cleaning up dust. The table is quite spacious and this will make it possible for you to do a lot of projects on it. Versatility is another advantage that you will get if you are able to purchase this unit. It has two features of the product that makes for enhanced versatility. The legs are adjustable meaning that you will be able to position the surface at a height that is most suitable for you to work efficiently. Secondly, table is quite flexible and easy to work with thanks to the combination of the miter and T-track. The package includes other added tools such as the castors, table, setup bars, two featherboards and switch. These added tools make your router table a good addition to your workshop. It is expensive especially if you are a first time user. But this will not be an issue where money is of no concern. PRS1045 is a router table that can compete in durability, versatility, functionality and in other aspects with other quality router tables in the same level with it. It is an embodiment of excellent construction and workmanship. It has a lot of features which any woodworker will find useful. I think, you will not regret it if you purchase this product especially if you are a beginner. RouterTableExpert.com is a participant in the Amazon Services LLC Associates Program, an affiliate advertising program designed to provide a means for website owners to earn advertising fees by advertising and linking to Amazon.com, and any other website that may be affiliated with Amazon Service LLC Associates Program.